Our partners in Brazil, Minha Biblioteca, are licensing the Slicebooks platform source code in order to roll out a customized version to the Brazilian market. We’ll continue to provide dev support and other features along the way. This is an exciting step for us as we plan to do the same in other regions of the world. While continuing to target higher ed, Minha will also be exploring the enterprise market as well. See our white label store site for more information. Read the full press release here. We believe our white label digital content stores offer the most innovative solution on the market for publishers and other content creators wanting to launch their own branded stores. The combination of unique features and affordability simply can’t be beat. It’s the only store where customers can buy content by the chapter or article, or curate their own custom ebooks. And store owners can take advantage of the advanced features in the Slicebooks CMS to create multimedia ebooks and launch unlimited StoreApps, which are embeddable custom store widgets that can be put on any site to target niche audiences. Rowman & Littlefield Publishers wanted to revitalize and digitize their journals program and chose Slicebooks. This store features journals by the issue or article, and a digital subscription module that lets institutions and libraries sign up for annual digital subscriptions. Minha Biblioteca, a consortium of the leading higher ed publishers in Brazil, wanted a store that would let professors create custom course packs and allow students purchase content by the textbook or chapter. Our white label store has both features already built-in! We localized it in Brazilian Portuguese and it is now in a soft-launch phase. “We always wanted to allow our readers to create their own short story anthologies mixing their preferred short stories from different books and authors, but it was impossible to do it in print. Nowadays in the digital age, and thanks to Slicebooks remix technology, we can offer this innovative service to our readers,” said Juan Casamayor, Publishers of Páginas de Espuma. Micro Store widgets can be used in a variety of ways to push direct sales and to grow vertical markets. For example, some authors have blogs with large and loyal reader bases with common category interests. Micro Stores can be embedded on your author sites and customized to offer just that content that is of interest to the author’s audience. Here’s an example of the App embedded in the main body of this blog that has content filtered for a Travel audience. It sizes dynamically to adjust to column width. Users can now browse and putchase content, and create their own custom ebooks, directly within this blog site. Checkout happens within the app as well, so the user never leaves the site. Or you can open this link to view the app on your mobile device. We partnered with SayulitaLife.com in Mexico to launch a new yabeam-powered proximity marketing app targeting the fast growing tourist destination town of Sayulita. Called SayulitaPack, the app lets merchants take advantage of yaBeam’s unique platform to launch geofencing and push campaigns featuring dynamic merchant coupons, multimedia news about the town, features about merchants and non-profits and updates on local events. Check it out on the App Store and Google Play. We’re showing off both yaBeam and Slicebooks at BEA 2016. Customers will be able to get whole collections, individual short stories, and mix and match to curate their own short story collections. Slicebooks, an innovative provider of publishing tools and white label stores, has partnered with Páginas de Espuma of Spain to launch “RelatosRevueltos.com” (loosely translated it means “scrambled stories”), a new ebook store dedicated to short story collections. As is standard with all Slicebooks white label stores, all content is made available whole or chunked. In this case, customers will be able to purchase whole short story collections or just individual stories. They can also use the built-in ebook curator tool to drag and drop stories and create their own curated custom ebook. The store is scheduled to launch in Q3 2016. The Slicebooks platform features innovative tools like the eBook Slicer, eBook Curator and StoreApp Widgets, all designed to help publishers repurpose content and sell direct to consumers. The Slicebooks white label program lets publishers brand their own iTunes-style store with all the unique Slicebooks features included. Slicebooks has localized RelatosRevueltos.com into Spanish. “When we built the white label Slicebooks store platform, our vision was that it would be adaptable to a variety of use cases, and that’s proving to be true”, said Jill Tomich, co-founder of Slicebooks. “One of the first stores we launched, the Rowman & Littlefield Journal store, called “journals.rowman.com”, provides academic journals whole or by the article. PastadoProfessor.com, the upcoming Brazilian HigherEd store, will offer over 3000 academic books and 60,000 chapters so that professors can curate custom course packs and students can purchase content whole or by the chapter. RelatosRevueltos.com is a personal favorite. Being short story fans ourselves, we’ve always thought it would great to be able to browse and buy short stories individually,” said Tomich. Another unique feature of the Slicebooks white label stores are the StoreApp widgets. These are embeddable widgets with full ecommerce functionality that can be created in minutes, branded and used to target niche audiences. For example, authors or anyone who blogs can embed a branded mobile StoreApp right on their blog site and fill it with content customized for their particular audience. This means that, for RelatosRevueltos.com, if there are blogs or other sites that review or discuss short stories, Relatos Revueltos can create a widget to embed on those sites so that visitors can easily purchase the short stories they are reading about, all without having to leave the blog site. Páginas de Espuma is an independent publishing house founded in 1999. It is one of the leading publishers of the short story genre in Spain and Latin America and is also well known for its humanities collection. With an average of twenty new publications a year, Páginas de Espuma has published works by some of the most revered writers in the Spanish language, and has built a reputation among authors as one of the most respected publishers on both sides of the Atlantic. When we first built Slicebooks and talked about the value of repurposing content by chunking books into sellable chapters, publishers and other people would sometimes ask, why would we want to buy a slice fiction? Well, as a rule you likely wouldn’t want to buy just a chapter of a novel. Unless the publisher wisely chose to offer sample chapters, or the author wanted to experiment with serializing the book over a period of time as Stephen King and other authors sometimes done. Then chunking makes sense. But short story collections are another story. It always made sense to us to give readers the opportunity to pick and choose what stories they want from a given collection, and to curate their own collection if they wish. Seems a natural. 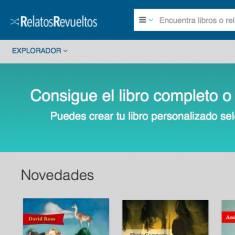 That’s why we’re so thrilled to partner with Páginas de Espuma in Spain to build “RelatosRevueltos”, the first short-story store to take advantage of the Slicebooks platform. Now fans of Spanish language short stories can browse and grab just the stories they want, or use our ebook curator to mix and match stories and create their own collection. Pretty cool. “We always wanted to allow our readers to create their own short story anthologies mixing their preferred short stories from different books and authors, but it was impossible to do it in print. Nowadays in the digital age, and thanks to Slicebooks remix technology, we can offer this innovative service to our readers,” said Juan Casamayor, Publisher of Páginas de Espuma. We’re excited to be soon launching our first Portuguese white label store, called “Pastadoprofessor”, created in partnership with Minha Biblioteca, a a consortium of leading academic publishers in Brazil. This store is targeted at the Brazilian HigherEd market. Professors will be able to curate and make available custom course packs on the fly using the store’s built-in content remixer, and students will be able to get content whole, sliced and remixed. Pretty cool. We’re thrilled to announce our new Journals Store launch with Roman & Littlefield. Now Rowman’s journal customers can get whole issues, individual articles, or mix & match to create custom journals. We also build a new subscription module so that libraries and other institutions can subscribe to digital editions. See the press release here. And check out the new Journal Store here. Beacons require users to have an associated app and to opt-in for notifications, so all communication is voluntarily received. For book publishers to leverage the huge potential beacons offer, you will need to partner with popular apps and new companies that will be focusing on building beacon-based venue networks. In some cases, your content could then be added to a library of content that can be licensed as a package and delivered to brands as a value-add. Or you will be able to purchase listing space on beacons located at niche venues where your content will be featured in alerts to that perfect niche mobile audience. We will soon be launching YaBeam, a beacon-based mobile marketing platform that publishers can use to engage mobile audiences via “venues” that can be anywhere. You can signup for alerts about the YaBeam launch here.